Titanium Metal Injection Molding combines the design freedom of innovative manufacturing processes with the superior properties of Titanium to create innovative and customized products. 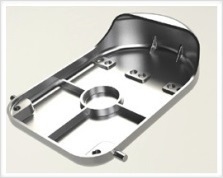 Our unique Titanium Metal Injection Molding (Titanium MIM) process combines the ability to create new product shapes with vastly reduced production costs. We work to accelerate the substitution of less durable aluminum and heavier stainless steel alloys with affordable titanium products. The production of titanium parts or components by injection molding is stabilized by a good understanding of how each process variable impacts density and impurity level. The base for the Titanium MIM process is a fine Titanium powder, mixed with thermoplastics to the so called feedstock. The feedstock is injection molded in custom tooling to create the desired shape, followed by an extraction process to remove the organic components. The last process step is a heat treatment (sintering) which gives the final product its density and durability. 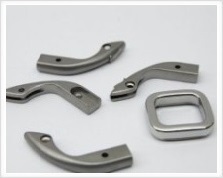 We use Ti-6Al-4V alloy as typical MIM material for Titanium Metal Injection Molding (Titanium MIM) parts. Ti-6Al-4V = Titanium alloy with 6% Aluminium and 4% Vanadium is also commonly called Ti Grade 5.